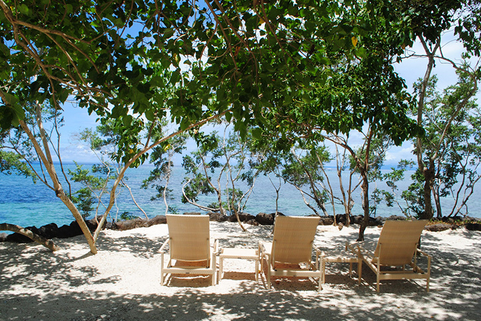 Entrepreneurs who intend to enjoy a well-deserved vacation should consider this hidden treasure along the coast of Bohol. According to legend, the Philippine hero Lapu-Lapu in his youth saved seven dolphins that later returned and aided him in his adventures. These dolphins and their stories became the inspiration for Bluewater Resorts, a resort chain that originated in Lapu-Lapu’s native Cebu province. Present in the company logo as symbols of adventure, wonder, and culture, Bluewater’s dolphins have moved beyond the shores of Cebu towards the white sand beaches of Bohol. A few minutes away from Tagbilaran City’s airport, Panglao Island is host to Bohol’s white sand beaches, numerous dive sites, historic buildings, and breathtaking sunset views. Along its western coast lies Bluewater Panglao--the latest addition to the Bluewater family--that opened in July 2011. Like other Bluewater resorts, Bluewater Panglao offers family-friendly facilities as well as activities parents and children can enjoy together or separately. Board games and movies are available for children while parents can unwind by the poolside bar. Visitors can choose from a variety of services—from day trips to honeymoon packages. For those spending only a day in Bohol, P1,200 to P1,500 per person can cover Bluewater’s Bohol Daydream, granting guests access to the resort’s pool. An additional P700 covers food and beverage expenses. Each room in Bluewater Panglao reflects a modern approach to Philippine architecture while staying in sync with the tropical environment. The décor and furniture take inspiration from nature but still give off the air of a luxurious tropical paradise. This feeling is kept throughout the resort with the tree-lined pathways leading to the restaurant and second pool. Most of the resort’s rooms have a balcony or porch facing the main pool. For those wishing to stay on the island for three days, the Meet Bohol (ideal for family and friends) and Private Journey (ideal for couples) packages include spa treatments, a choice of Bohol tours, and even theme dinners. For those who just want to relax, the hotel offers rooms starting at P10,000 (Deluxe, low season) up to P50,000 (Family Pool Villa, peak season). Bluewater also has Honeymoon Pool Villas, each with its own mini-pool for the couple to share. 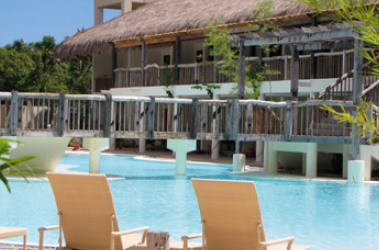 Besides its amenities, Bluewater Panglao also offers a wide range of activities for visitors to try out. Down by the beach, guests can snorkel or dive in the Marine Sanctuary or take a 30-minute boat ride to Balicasag Island, where sea turtles can occasionally be spotted by a lucky diver. There are also guided historical tours showcasing the history of Panglao, Tagbilaran, and nearby municipalities. For those hoping to experience the natural beauty of Bohol, eco-tours are also available: from visits to the Tarsier Sanctuary to the nighttime firefly river cruise to seeing the symbolic Chocolate Hills. Visitors between the months of March and June would have the opportunity to experience the peak of Bohol’s whale-watching season. Photos from Bluewater Panglao Website (main) and Alex Grant. This article was originally published in the March 2012 issue of Entrepreneur magazine. Subscribe to the print or digital version here.